Grazing on lush pasture appears to be the best defense against a degenerative disease that can affect the brain and spinal cord of susceptible horses, according to a review. University of California, Davis, researchers Erin Burns and Carrie Finno recently published a review of equine neuroaxonal dystrophy and equine degenerative myeloencephalopathy. They are clinically indistinguishable diseases, with the latter being a more advanced form. It is an inherited neurodegenerative disorder that affects many horse breeds, including the Standardbred, Appaloosa, Morgan, Lusitano, Paint, Thoroughbred, Arabian, Norwegian Fjord, and Quarter Horse. A breed-specific susceptibility has not been identified. Clinical signs include a symmetric ataxia (lack of coordination) and an abnormal stance at rest, similar to cervical vertebral compressive myelopathy, equine protozoal myeloencephalitis, and equine herpesvirus 1 myeloencephalopathy. Definitive diagnosis requires postmortem evaluation of the central nervous system. Burns and Finno say that because many horses with neurological problems are euthanized without postmortems, it is impossible to know the true prevalence. The pair, writing in Veterinary Medicine: Research and Reports, said while a genetic susceptibility to the disease is highly suspected, the genetic basis currently remains unknown. Its prevalence, they said, would more accurately be assessed if a genetic marker or biochemical test was available. The pair noted that early studies had determined that foals raised on pasture incurred a protective effect against development of the disease, believed to be due to the increased consumption of vitamin E.
This hypothesis was also supported in vitamin E supplementation studies, showing a decrease in disease incidence within susceptible populations when supplemented. The mechanism by which vitamin E protects a foal from disease development is currently not fully understood, they said. There were, they noted, many different products on the market to supplement vitamin E in a horse’s diet, but it was important that the product contained vitamin E in a bioavailable form. It is known that D-a-tocopherol (RRR-a-tocopherol) is the most potent, bioavailable isoform of vitamin E. The cost of supplementation for one genetically susceptible foal over the course of two years is nearly US$3500. “Both the mare and the foal must be supplemented with this high dose of D-a-tocopherol (RRR-a-tocopherol) to achieve sufficient protective effects,” they said. Daily oral administration is required. When diagnosing the condition, it is crucial that vets rule out all other possible causes of the observed neurological problems, they stressed. Once incoordination is apparent, supplementation will not improve the neurologic deficits. Disease progression can be halted through supplementation, but the general proprioceptive ataxia will remain. Clinical signs typically progress at varying rates until the horse reaches two years of age, at which time signs stabilize. Currently the best management practice for prevention of the two conditions is to maintain pregnant mares, foals, weanlings, yearlings, and two-year-old horses on lush green pastures. 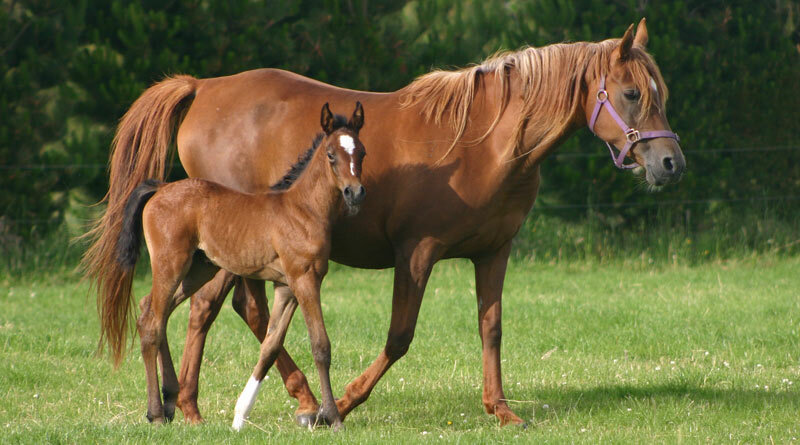 Clinical signs in susceptible horses may be seen as early as 1–2 months of age, according to the pair, who say the first few months of life present a critical window to head off the disease. Work is under way to develop a genetic test for the two conditions at UC Davis. “A genetic test would allow breeders to make more informed decisions about their breeding and management practices, ie, not breeding-susceptible individuals in a dry climate lacking adequate access to pasture. The review, published under a Creative Commons License, can be read here.